Arbitration lawyer William Kirtley has been interviewed by the Moscow-based newspaper Novaya Gazeta regarding the enforcement of arbitral awards against State assets. 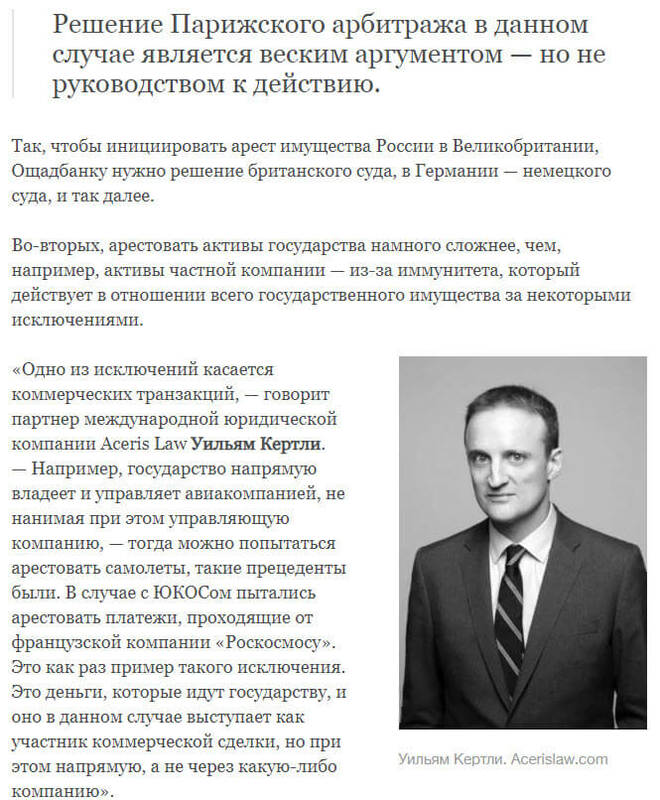 In the Russian-language article, concerning a USD 1.3 billion award to Ukraine’s Oschadbank for compensation for loss of assets in Crimea following annexation of the peninsula in 2014, William Kirtley explains that it is far more complex to seize the assets of States than to seize the assets of companies due to sovereign immunity, which grants each State immunity for its property from the courts of another State, subject to certain exceptions. One exception concerns commercial transactions, which can and have been targeted in the past in order to successfully collect amounts owed under arbitral awards issued against States. The 2004 UN Convention on Jurisdictional Immunities of States and their Property, although not in force, is the most authoritative guide on exceptions to sovereign immunity before national courts, according to Mr. Kirtley. According to Mr. Kirtley, Oschadbank will be acutely aware of the problems enforcing prior awards against Russia. Many Russian assets were targeted by Yukos’ shareholders, as is typical, including funds held by French satellite launch company Arianespace owed to Roscosmos, TsENKI and NPO Lavotchkine, land that was attached near the Eiffel Tower in Paris, assets including real estate in Brussels registered in the name of two Russian news agencies, and money held in various bank accounts. None of the attempts to seize assets of which Mr. Kirtley was aware were ultimately successful and, in reaction, both France and Belgium passed new laws making it even more difficult to seize State assets. According to Mr. Kirtley, Oschadbank will have to conduct stringent due diligence before initiating enforcement proceedings, and it would be expected to similarly target land, bank accounts and commercial debts owed to the Russian State, if it can find them. In short, enforcement against a recalcitrant State depends on the assets that can be located that satisfy the narrow exceptions to sovereign immunity. Lack of jurisdiction will almost certainly be a ground for annulment argued at the seat of arbitration, according to Mr. Kirtley. Oschadbank brought the cases under the 1998 Ukraine-Russia bilateral investment treaty on the basis that Russia assumed responsibility for the protection of Ukrainian investment in Crimea after the event in Crimea. However, Russia will argue that Oschadbank was a domestic investor investing in Ukraine, so the arbitral tribunal may lack jurisdiction over the dispute today. If Russia manages to set aside the arbitration award at the seat of arbitration, for instance on the basis that the arbitral tribunal wrongly upheld its own jurisdiction, then it could very well avoid paying anything at all (although some European countries do allow the enforcement of arbitration awards that are annulled at the seat of arbitration, notes Mr. Kirtley). Even if set aside proceedings fail, however, according to Mr. Kirtley, it will not be easy for Oschadbank to enforce the award against Russia, and considerable due diligence will be required in order to find appropriate assets to be targeted. Enforcement battles may therefore last for years, according to Mr. Kirtley, even if Russia fails to set aside the arbitration award at the seat of arbitration.